Welcome to my new blog. I’ll be writing about mathematics — doing, learning, teaching– and maybe anything else that strikes me as interesting. 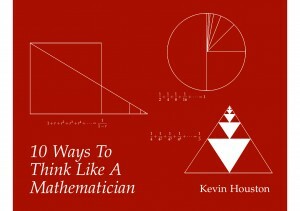 First, I have a short pdf to give away: 10 Ways to Think Like a Mathematician. Please distribute it if you like it or are inspired by it! The booklet is a taster for my book How to Think Like a Mathematician. In the coming weeks I’ll be posting videos for the book. Stay tuned! Thanks for your interest in my book. Currently, there is no Vietnamese translation so probably the best way to get a copy is through the usual foreign book suppliers in your country. Does that help answer your question? 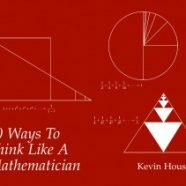 I send you this message to thank you for your book “How to think like a mathematician.” With this book, I realized many things I had never understood before. I am not good in math but I would like to understand much more. I bought your book but I would have liked the correction exercises that are in your book. I’m doing a math learning, and I’d like to have your advice. Thanks for getting in touch. I hope to have some exercise solutions available soon. Not sure how soon but I’m doing my best!